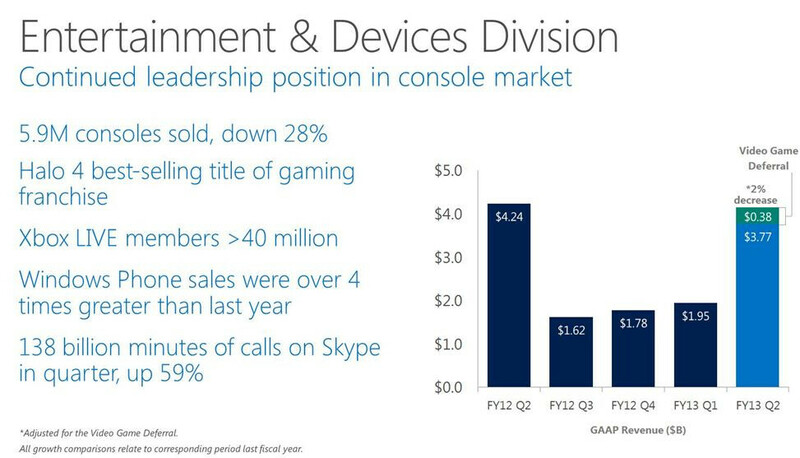 Rumors about Microsoft's demise and "the end of the PC era," as Steve Jobs used to put it, seem to be greatly exaggerated, judging by the company's Q4 results. The folks over at Redmond managed to pull in $6.38 billion profit on just $21.5 billion revenue. In comparison, Apple made $13.1 billion, but on $54.5 in revenue, and Samsung hauled in record $6.6 billion of net profit from $52.45 billion of revenue. If we round up the margin percentages, we get 30% for Microsoft, 24% for Apple, and 13% for Samsung. Google scored about 20% margin. Moral of the story is that Microsoft still keeps the most money from its revenue when all is said and done, and the revenue it received from its mobile operating system division grew to $546 million. Granted, we'd bet that most of it is patent-related royalties from Android manufacturers, rather than Windows Phone licenses sold to Nokia, HTC, Samsung and the others, but it is perhaps in line with what Google is actually making from Android at the moment. We'll see how this year develops, but Microsoft seemingly has a fighting chance to turn this mobile game into a three horse race by the time the holidays hit. What do you think? exactly, I highly doubt there will ever be a day that people only own smartphones & tablets. But there are guys like me who still find PC is very useful. I work around with design thingy programs like corel/adobe. I know about adobe mobile, but it's not really enough for me, no no no no. Thank you bye. There absolutely will be a day when people only own smartphones and tablets. Microsoft absolutely has the right idea in trying to pack a full fledged computer into a tab because it is literally the future. I say this because people said the same thing about wanting GPS, HTML browsing, and MP3 player in their smartphone. It will happen and these companies need to be sure they are on the correct side of things. The standard Keyboard/Mouse/Screen layout has been developed for years, and won't go anywhere for a long time because you can not get the speed or comfort or accuracy out of tablet or phone. Think about it.. how will engineers, artists, etc.. who need CAD and 3D capability.. going to do that on a small tablet? Ergonomically how do you figure that out as well..? I have 3 large screen and need a mouse for accuracy.. there is NO WAY the work I do can be replaced by a tablet or phone. What about data entry.. Know anyone that can get 100 WPM on a tablet? Didn't think so. With ya on that, though I think you have well more than a decade before you see PC's in homes really wane. Sales may slump a bit, but that's going to be more because today's middle of the road PC build is more than powerful enough for day to day usage for a long time to come. Only those with broken PCs or heavy gamers will continue to upgrade regularly. It's not like it used to be where a casual/business user would actually see big benefits to upgrading to the latest. We passed the line of "need to upgrade for a much better day to day experience" a long time ago. I actually disagree. I see the future computing landscape where people's phones are also their computers, and they connect to peripherals wirelessly, over NFC more so than DLNA. It's already begun with Bluetooth everything and more peripherals coming for NFC, and with Windows Phone 8 sharing its kernel with its big computing sibling Windows 8. Cables will be a thing if the past except for secure transmissions, and folks will eventually spend about the same as they are now for an entire computer or laptop setup for everything to be wirelessly connected, and as that is saturated, prices will go down. As long as there are "real developers" who hate CLOUD ... PC era will never end. The old horse still got some juice in the inside. Lol! Abdane you are so right. You're right Wendy. Exactly right. I using Apple, Microsoft and Google services. I am currently in favour of Google as they do give value added service without me paying them a single cent. Microsoft is also great with the Xbox360 games, Halo series. Apple i like their design but that wearing out... A phone is just a phone. I don't think there a need to be defensive, which your above posting made out to be. I'm almost in the same boat as you. I really like Windows desktop OS....currently using 7 and XP. I really like Android phones. I like Apple....stock...dont have any anymore but I hope it can do down enough where I can get back in on the extreme low side. Either that or is all in your delusional head... A there were not such comments in the thread made by Android fans. Buzz!! Wrong. No where in that post does it says MS is greedy. Try again... Maybe since you suggested it...it will happen....eventually. Usually...its best to wait til it actually happens first? Well wendy....I'm waiting for the posts from Android fans saying MS is greedy.... Still waiting.....this is an example of creating bias, faboyism where none exsist. Nice try tho.....I think?